Day three of this (possible) eight day run is here as we are an even 50 days away from Opening Day. Picking out the man who wears number 50 on his back for the Milwaukee Brewers might seem a little like finding the right car at the dealership. Many choices to be sure, but there’s just something about this particular model that makes it stand out. In this case, those conspicuous features include a bald head, lean body, and most notably a 6’8″ frame. I’ve been including a picture of each player as I’ve gone through this series, but briefly considered simply putting a picture of the lightning rod in this space and then just including Loe’s picture later in the piece. It makes sense, doesn’t it? 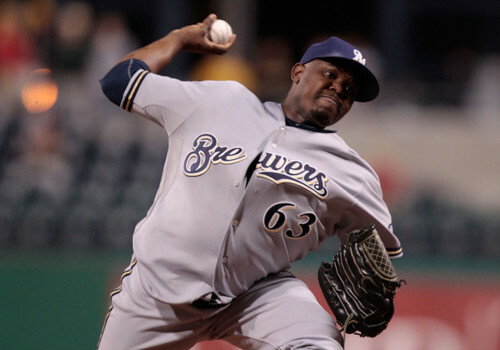 Nobody attracted more heat throughout the year on a Brewers’ mound than did Loe. Loe pitched in parts of five seasons with the Texas Rangers before spending 2009 pitching professionally in Japan. 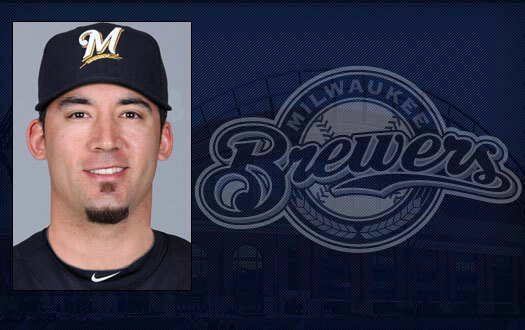 The Brewers lured him back in 2010 so the upcoming season will be his third with Milwaukee. Sure, Zack Greinke caught heat for his basketball escapades, and Shaun Marcum had his struggles late in the year, but deservedly or not Kameron David Loe caught heat early, often and consistently throughout 2011. Loe’s 2011 season consisted of 72 appearances in which Loe totaled 72.0 innings pitched, a 3.50 ERA, 65 hits allowed, 30 runs allowed (28 earned), 4 home runs, 18 walks (two of which were intentional), and 61 strikeouts. He also hit two batters. Loe tallied one save and posted a record of 4-7. He did appear in five games in the 2011 postseason, pitching twice against Arizona and thrice opposing St. Louis. The Cardinals put the only dents into Loe’s ERA by tagging him for four earned runs in Game 2 of the NLCS on October 10, a game which St. Louis won 12-3. In three of Loe’s appearances he gave up at least three earned runs. Those three appearances combined for 12 earned runs in only 1.1 innings pitched. They were ugly outings and you can’t discount them when analyzing Loe’s season, but to fly off on the other end of the spectrum and try to claim that Loe was terrible more often than not or that he couldn’t ever get anybody out would be just as foolish. Loe made 54 scoreless appearances and seemed to give up runs in appearances which were bunched together, though not always consecutively. What that means is probably a whole lot of nothing, but the facts remain. Following the injury to Takashi Saito and kid-gloves approach the Brewers used with LaTroy Hawkins through much of the year, Loe was forced into working a lot of situations he normally wouldn’t have been called upon for. He was pitching to left-handed hitters in high-leverage situations. He was pitching in close and late situations. It cost him and the team. If you’ve been a faithful reader of the series, you may recall that I mentioned in the Francisco Rodriguez article how when the Brewers acquired K-Rod their bullpen had already lost 20 games. Well, seven of those were Loe’s. To point out another thing, Loe wasn’t the pitcher of record in a loss once Rodriguez was acquired. As the back-end of the bullpen got filled out throughout the year, Loe was able to pitch in situations more suited for his skill level and abilities. In an ideal world, Loe wouldn’t have to pitch to a left-handed hitter ever. He also would be used situationally in either early bullpen work for full innings for possibly 7th inning work when the match up at the plate works in his favor or the situation dictates a certain kind of pitcher being needed. The reality of the baseball life is that Loe will be called upon in situations that are, for lack of a better phrase, above his pay grade. So long as those behind him in the bullpen repeat their solid seasons and allow Loe to pitch to his strengths, I expect that Loe will have an even better ratio of quality appearances to awful ones. Loe’s ratio of ground ball outs to outs recorded in the air was an impressive 2.77 in 2011. That’s aided by the number one pitch in Loe’s repertoire: a sinker which he throws between 88-90 MPH. According to Pitch F/X information, he threw his sinker 78.6 percent of the time in 2011. He secondary pitch was a slider thrown with an average velocity of 79.4 MPH. He threw a handful of change ups but nothing worth noting. Interesting to note is that Pitch F/X said that Loe didn’t throw a straight fastball all season. The sinker had pretty good movement, breaking down and in to right-handers, and the slider moves enough to where it can be a fair compliment to the sinker. As that 2.77 GO/AO ratio points out, though, the sinker is Loe’s main weapon. 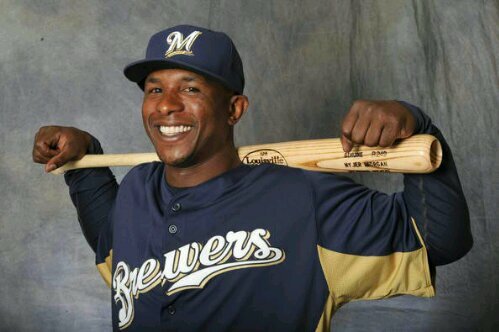 Loe was eligible for salary arbitration this offseason and settled with Milwaukee at a figure of $2.175 million. With the departure of Hawkins and Saito in free agency, Loe’s veteran leadership will be a welcomed presence. With the addition of Jose Veras via trade, Loe should primarily pitch in those controlled situations which I outlined earlier. Put it all together and the result will hopefully be a positive contribution to Milwaukee’s efforts to repeat as NL Central Division Champions and take the next step or two in 2012. Opening Day is 59 days away. 59 days from the regalia and tradition of team introductions, bunting hanging from stadium facades around the league, and thunderous applause when the home team pitcher delivers the first pitch of the season. For #59 on the Brewers By the (Jersey) Numbers countdown, despite it not being an exact match by calendar day Opening Day is the anniversary of his worst outing of the season. That’s right, Brewer Nation, we’ve finally reached the point in the countdown where players with significant amounts of MLB service time will start showing up in this space. John Berton Axford hails from the great north and has a well-documented path to the big leagues. It’s not one that I’ll rehash here, but if you haven’t heard about his time as a cellphone salesman and bartender, nor read about how Jay Lapp braved treacherous weather to see Axford throw one cold, Canadian day, do yourself a favor and head to Google when you’re finished here. 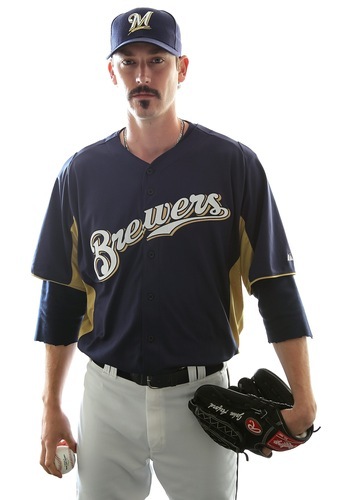 Standing 6’5″ makes Axford an imposing presence on the mound. He may not be Kameron Loe out there, but Axford utilizes his height very well in his delivery. The right-hander features a high-octane fastball that has tickled 98 MPH on the radar gun, a slider with good movement and a curve that keeps hitters plenty off-balance. No doubt you’ve seen many a hitter throughout the 2011 season swing under and behind a fastball that crosses the plate at or higher than his neck. Well, that happens because Axford’s curve ball moves so well that it makes his fastball up and out of the strikezone extremely tantalizing to swing at. Axford mixes pitches well, doesn’t rely on any specific sequence, and throws his off-speed stuff for strikes. It makes for a tough assignment in the ninth for any group of opposing hitters. It’s an assignment that resulted in Axford converting 46-of-48 Save opportunities throughout 2011. If you haven’t been paying attention to the Brewers since April 18, 2011 (by the way, the Brewers won the NL Central Championship and beat the Diamondbacks in the NLDS), Axford rattled off 43 consecutive Saves from April 23rd through the end of the regular season. It was that security in the 9th inning that championed the Brewers to a team-record 96 victories. After all, there’s nothing worse as a hitter than working hard to take a lead into the late innings only to have the lead evaporate within a few pitches. Which brings us back to why I mentioned Opening Day 2011 at all. It was in Cincinnati on March 31st where the Brewers hitters (with some help from solid pitching) sent the defending NL Central Champion Reds into the bottom half of the ninth inning down by three runs. Axford entered from the visitors’ bullpen and, for whatever reason, couldn’t get the job done that day. He surrendered a run to make the Brewers’ lead 6-4. Then, with two men on base, he served up a pitch to Ramon Hernandez that the Reds catcher deposited over the outfield wall giving his team a 7-6 victory. This was Axford’s first day without his on-the-job mentor from 2010, future Hall of Fame closer Trevor Hoffman. It was the first game of the year, one that saw a Brewer (Rickie Weeks) lead off a season with a home run for the first time. It was a win that was basically in the bag. There is plenty of talk in the sabermetric community that “closer’s mentality” is a myth. It’s something that is made up by agents as a way to justify higher salaries for the gentlemen that record the final three outs of a tight ballgame. I tell you this: whether you believe in the idea that closers are a different breed by designation, John Axford certainly is. Normal men might have allowed that crushing loss to affect them for a long time. Normal men might have pitched tentatively the next time (or 10), trying to avoid a game-losing home run and allowing the opposition to nickel and dime him to a loss anyway. Not Axford. He ticked off three saves, blew one on the aforementioned April 18th when he gave up a single run to the Phillies in a game that the Brewers ended up winning in extra innings anyway, and then didn’t blink the rest of the year. Sure, he gave up a run here and there, but was perfect much more often than not. In fact, in Save situations after April 18th, Axford gave up a single run only six times. That’s 37 spotless Saves. Of the six blemishes, one was an unearned run in Colorado (you can probably remember that defensive 9th inning if you try), and three more were from solo home runs. In other words, only twice over 43 consecutive Saves was Axford hit enough where the other team was able to manufacture a run. I think everyone can agree that Axford had a pretty good season. The other thing to remember is that several leads were blown before Axford even had a chance to take the mound. If-come-maybes notwithstanding, Axford could have had a chance at a 50-Save season. Even without those games, Axford still set the team record for Saves in a single season. 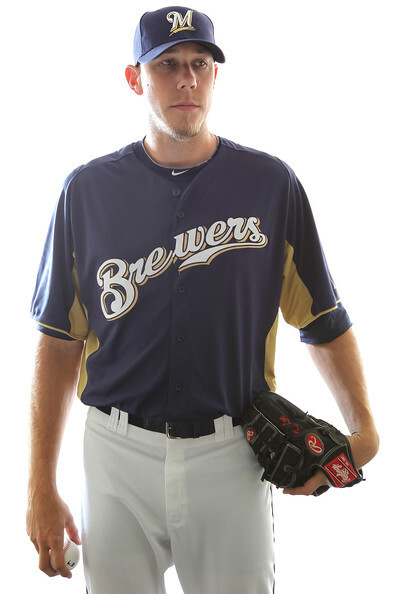 Going forward into 2012, Axford returns as one of the top closers in the game today. With what figures to be an offense that is down in run production from 2011, a quality bullpen will be more important than ever. After losing setup men LaTroy Hawkins and Takashi Saito to free agency, the trade for Jose Veras and return of Francisco Rodriguez after the team expected K-Rod to depart will prove to be very important moves. Their play in front of Axford will greatly influence the team’s success. The bottom line is that the ninth inning is still where the money is made though in that respect with John Axford, the Milwaukee Brewers are awash in riches.